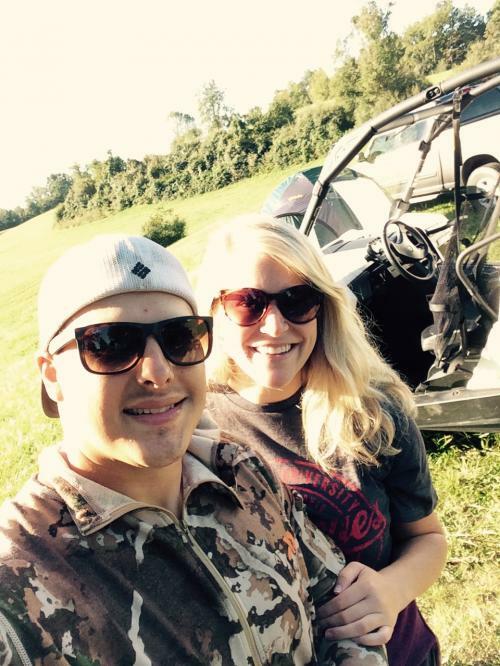 Welcome to Reel-Em-In Fishing Tours! 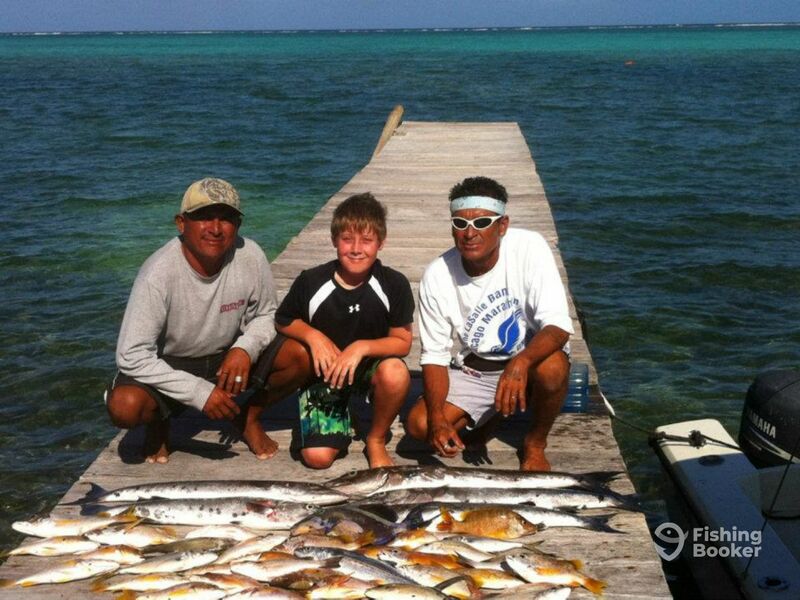 This is a local father and son fishing company on the beautiful island of Ambergris Caye, Belize. 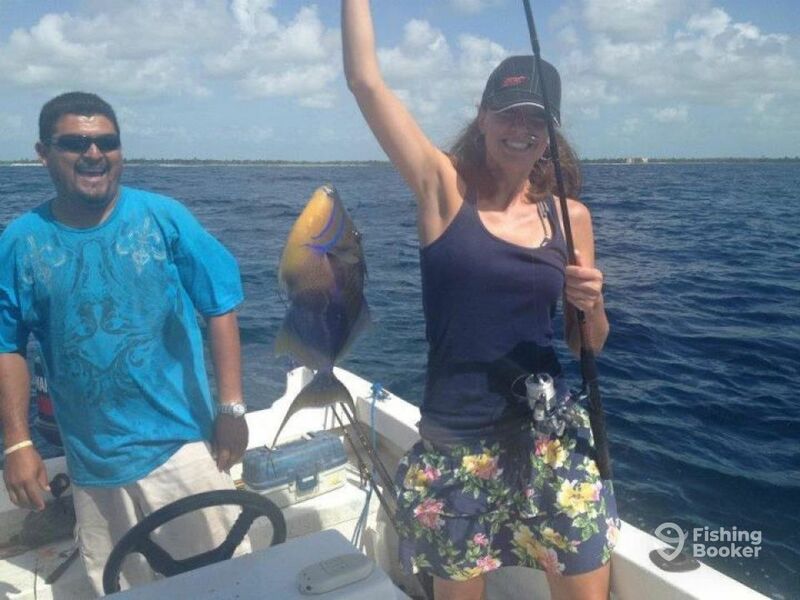 The Captains were born and raised in San Pedro and guarantee an absolutely wonderful day of fishing in Ambergris Caye. 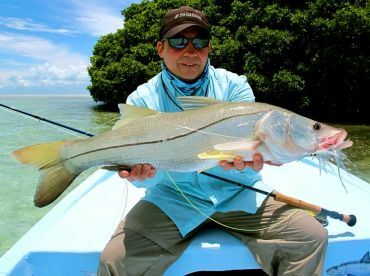 You will be guided by Captain Bicho Rivero, who has more than 25 years of fishing experience. 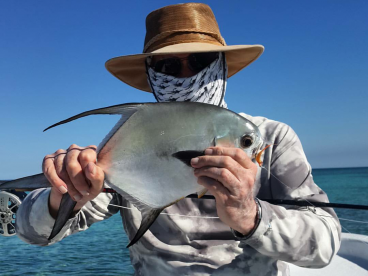 He is a well-regarded fisherman who has been fishing since he was 14 years old and knows all the best spots around Ambergris Caye. 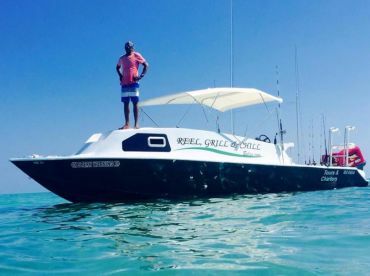 He will hook you up with some great fish here on Belize’s beautiful barrier reef. 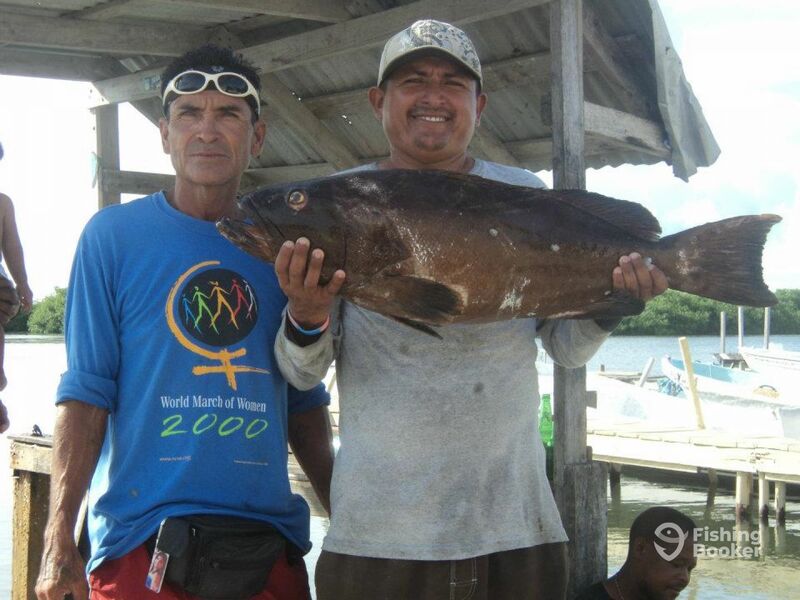 Captain Nestor Rivero, Bicho’s oldest son, has been fishing with his dad ever since he was a kid. He will make sure you have a great time when you’re on his boat! 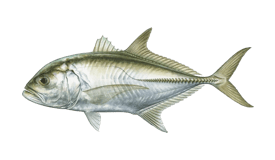 He has over 15 years of experience as a fishing guide and, like his dad, is very well regarded in the local fishing community. Captains Nestor and Bicho run their trips aboard a 26’ Aluna fishing boat. The vessel has room for 6 guests and comes equipped with a full array of safety gear to make your trip fun and worry-free. 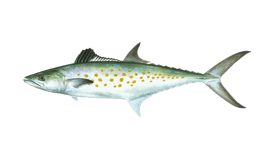 She also features quality tackle and a livewell full of fresh bait to tempt in even the fussiest fish. 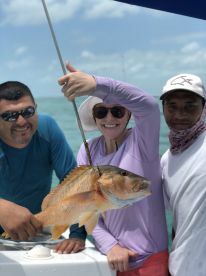 Reel-Em-In Fishing Tours specializes in getting groups on tasty reef fish like Snapper and Grouper. 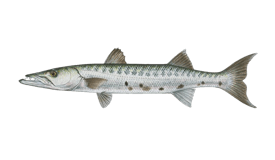 You can also hook Barracuda if you want some more fight with your bite. Depending on your trip, you can even enjoy a beach BBQ or some island hopping. However they can make your trip special, these guys will so with the smile of men who really love their job! 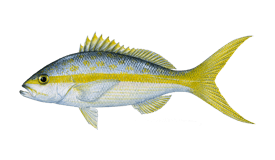 Spend the day fishing and snorkeling then take time off to have a delicious BBQ. 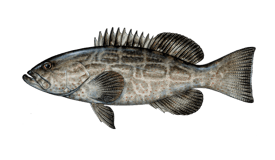 The crew will cook up your catch for one of the freshest meals you'll ever eat! 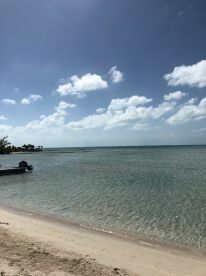 Fish during the morning and have lunch on the stunning Caye Caulker then snorkel the beautiful reef of Coral Garden. You can really make a day of it on this trip! 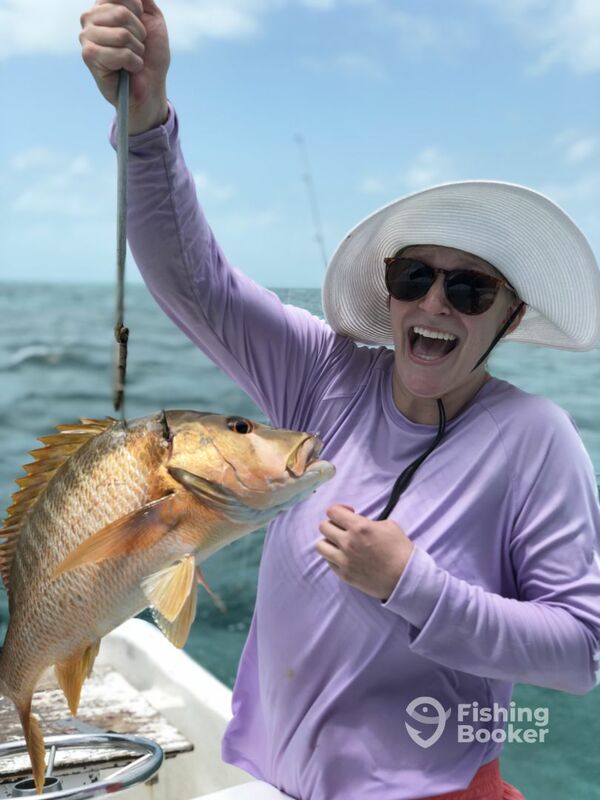 Spend the whole day fishing for various Snappers, as well as Grouper, Barracuda, Jacks, and more on this 7-hour sportfishing trip. 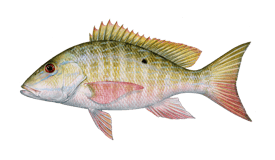 Spend the morning fishing for Snapper, Grouper, Barracuda and more around the local nearshore reefs. Aluna 26 (Saltwater fishing) построена в 2014, обновлена в 2018. Мотор – 2 115 л.с. Yamaha, максимальная крейсерная скорость – 40 узлов. 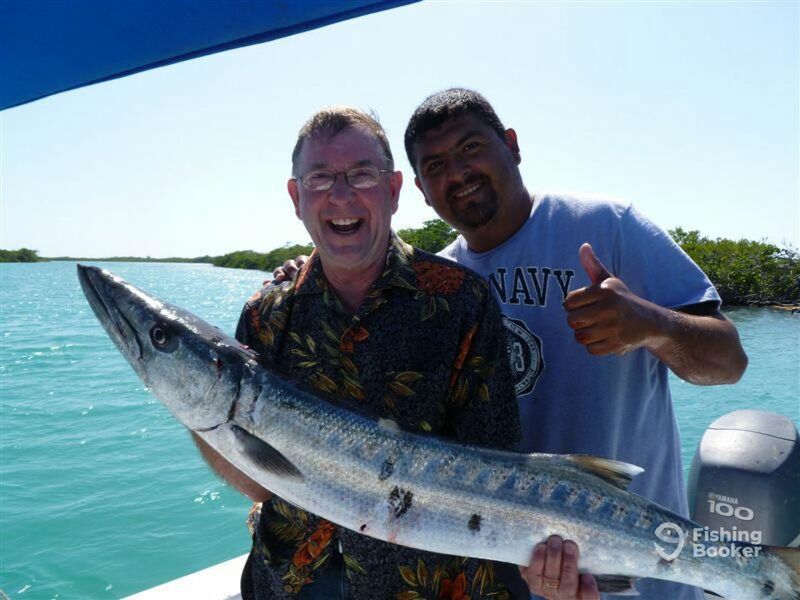 Captain Nestor guides for Reel-Em-In San Pedro with his father, Bicho. 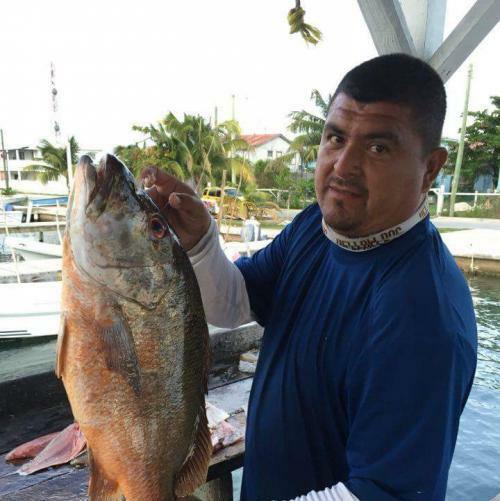 He has been fishing with his dad ever since he was a kid and knows all the best fishing spots around Ambergris Caye. 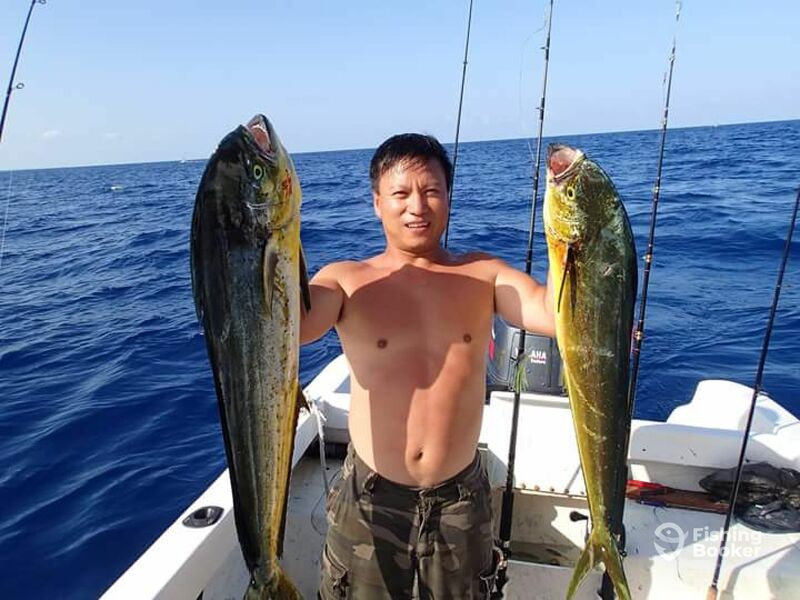 He has over 15 years of experience running charters in the area and is well known and respected among local guides and fishermen. He knows where, when, and how to get you on some real monsters! Nestor and Brian were awesome. They were on time to meet us and off we went to catch bait. Once bait was secured we went out and caught numerous fish. When we had enough for lunch he took us to the most beautiful beach for a home cooked beach barbecue. 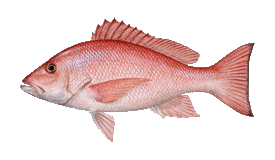 It was the best seafood I’ve ever had. Don’t miss out on the opportunity of a lifetime to go with anyone else. Nestor is your man! Thanks very much joseph u guys were awsome guests!!! 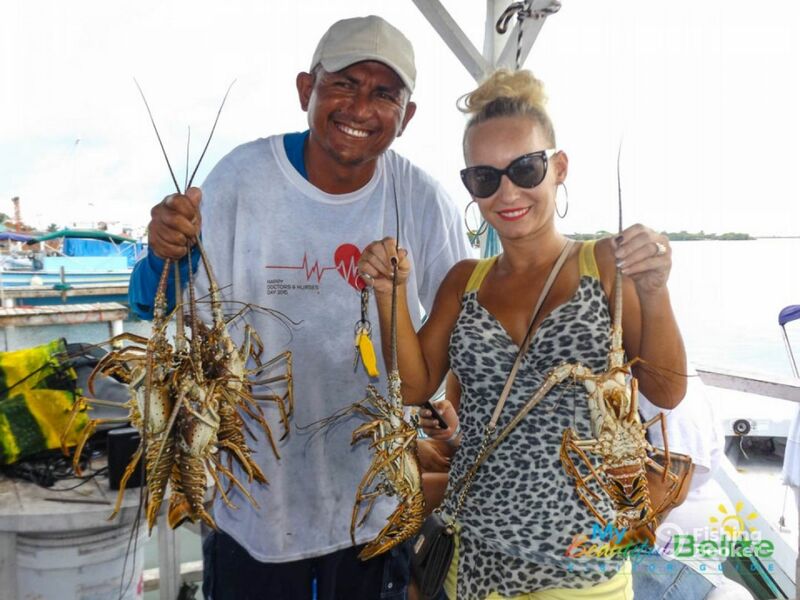 Hope u comback to visit our beautiful island again i have some Belizean Shrimps waiting for you!!!! 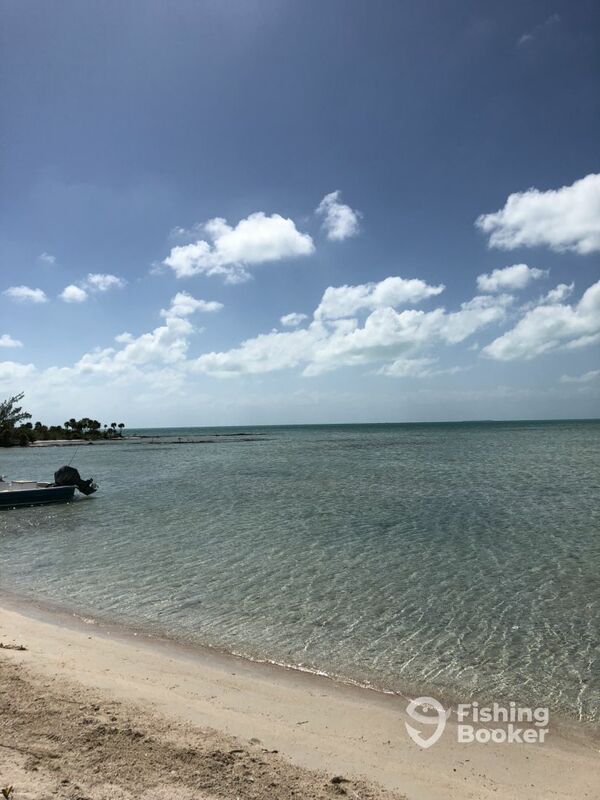 Nestor pocked us up from out hotel dock on Caye Caulker. The boat was smaller then we expected but with one of my boys fishing from the back of the boat and one from the front they had good time and caught plenty. 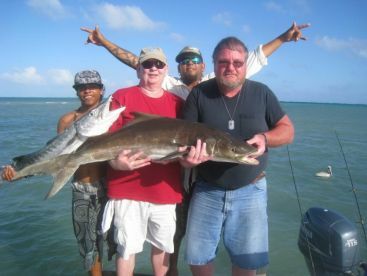 We didn’t fish with live bait and the ocean was a little choppy that day so we didn’t go to far out. Nestor cleaned our fish after the trip so we that were able to take it to a restaurant later for them to season and cook it for us. The first call back to home later that night was to my dad where my kids talked and bragged about the fishing trip. I had scheduled my trip well in advance and was in contact several times with the captain prior to our trip date. The morning of the trip I contacted him and he said he had mis-scheduled the trip for 3 days later. Talk about disappointed kids. We were only on the island 2 days and came just for the fishing trip as a birthday gift for our son. 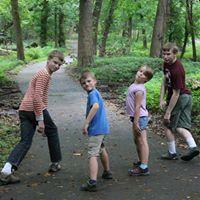 So we rescheduled for the following day and rerouted our plans a bit. The next morning I got an email that the captain had engine trouble and was cancelling again! The bad luck paired with the mis-schedule just seemed like it couldn’t be a coincidence. 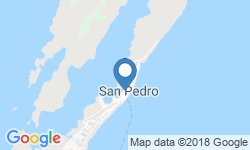 We contacted Fishingbooker and they were fantastic in resolving the payment issues, but we still had 4 pretty upset kids. 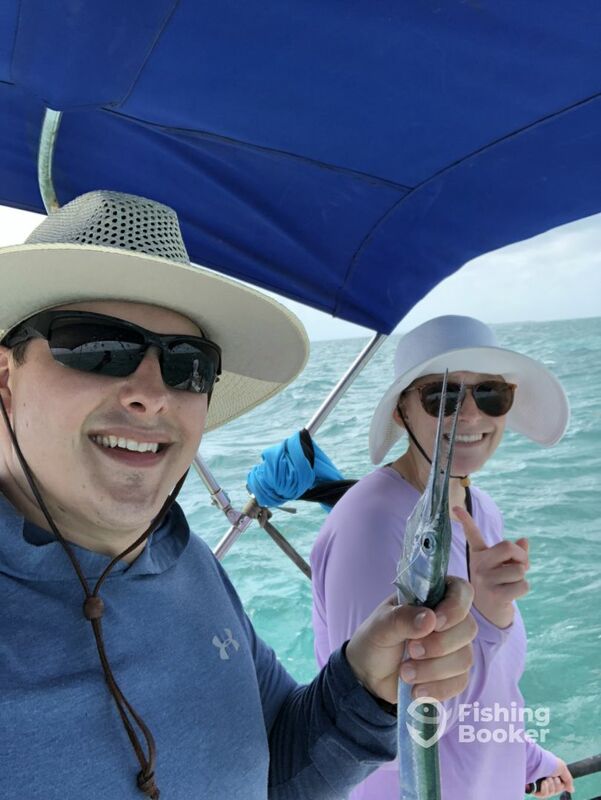 We caught plenty of fish, lunch was great, we couldn’t snorkel due to the high winds. My only real complaint was with the crew. Nestor and Carlos spoke Spanish to each other the entire time, without ever trying to engage us in an English conversation.